Whoo-hoo! Happy Wednesday everyone! I’m back this week with another card featuring stamps from the Good Witch Shoes set. You know I had to get one more Halloween Card in before the big day which is just about a week and a half away. 1. Hocus Pocus (my favorite Halloween movie). I can totally picture the Sanderson sisters wearing boots like those in the Good Witch Shoes stamp set. 2. The stamp set reminds me of the song, “These Boots are made for Walking’” by Nancy Sinatra. The song came out before I was born, but I’ve always really liked it. I started out by cutting down a piece of watercolor cardstock using a circle die. I stamped the boots and Happy Halloween sentiment from the stamp set and heat embossed them with some black embossing powder. I also ran the edge of my die cut circle across my Versamark ink pad so that all the edges had embossing ink on them. Next, I sprinkled the edge with the black embossing powder and heat set it. This gave the edge of my die cut circle a bit of definition. To color the boots, I used my Zig Clean Color watercolor brush markers and added some color and a bit of water. I ended up adding a couple of layers of color to brighten it up since the color can become diluted with the water. When my water coloring was dry, I used a Spectrum Noir clear sparkle pen and went over all of the white areas on the background and gave it the sparkle treatment. For my background panel, I used a simple sponge blending technique on another piece of watercolor cardstock. I blended 4 colors to create the background, orange, purple, navy blue and just a hint of black. Blending ink on watercolor cardstock takes a bit of effort to get a good blend. It just takes a bit of work to get a smooth blend. When the background was finished, I sprinkled a bit of water on the background to get the spotted effect. I used the bat from the Witches Spell stamp set and once again heat embossed them with some Pewter embossing powder. The Pewter gives the bats a bit of a metallic shimmer. To finish off the card, I added some purple gemstones to the background panel and adhered the whole thing to a piece of dark navy cardstock with some dimensional foam. I added my circle with the stamp and sentiment to the center of the background with some more dimensional foam. This was a super quick card today. They would be easy to mass produce and make lots of fun Halloween cards to friends and family. 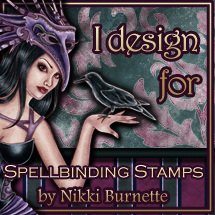 Be sure to check out the Dare 2B Artzy store to look at their Seasonal stamp line. You’ll find the awesome Halloween stamps I used for today’s card and so much more. There are stamps, dies and festive papers for all of your holiday card making needs. Hope you have a wonderful Wednesday! Thanks for stopping by.